Ethiopia’s altitude ranges from 13,000ft or so in the Simien and Bale Mountains, where it may be icy cold, to 100ft below sea level in the Danakil Depression, one of the hottest places on earth. More temperate is the Rift Valley diagonally bisecting the country from north east to south west, dotted with lakes and abundant wildlife. The oldest capital is the Queen of Sheba’s at Axum, birthplace of Ethiopian civilisation 3,000 years ago. Giant pre-Christian monolithic stele carved from single rocks – stairways for souls of the dead, greet the visitor, and The Ark of the Covenant is said to lie here. King Lalibela established the capital bearing his name in the 12th century. Legend has it the King asked the Archangel Gabriel to hew eleven churches from volcanic rock, and that he completed the task in 24 hours (In fact it took humans 22 years). They are really one of the manmade wonders of the world. Up behind the town, a morning’s mule ride away or a good hike, are astonishing monasteries carved into the surrounding hills. King Fasilidas (1632 – 1667) had his capital at Gondar, north of Lake Tana, where he and his descendants built fortified palaces. Such is the atmosphere; you almost expect a fanfare and knights in shining armour on fiery steeds. Fasilidas also constructed a huge bath, in which the community could bathe during religious festivals – and they still do, for example at Timkat, the Ethiopian new year on 19 January – it’s quite a sight to behold. On the hill looking across the town in sight of the palaces is Debre Birhan Selassie, “Trinity at the Mount of Light”, a gem of a little church. Its beamed ceiling is entirely painted with angels and biblical scenes. The angel heads, encircled with colourful wings, and the biblical scenes, all make for an intricate and visually arresting sight. Nearby, at Kusquam, through a door in the walled garden Empress Manteweb built her modest castle, and a house for James Bruce, the notable Scottish traveller and travel-writer, who stayed there five years and had a child by her daughter. On the south shore of Lake Tana is Bahar Dar. From here it is a short expedition to the Blue Nile Falls. You can also take a boat across the lake to visit a monastery on an island, or one on the Zeghe Peninsula (well-known for its coffee). Addis Ababa, the modern capital, is a lively, sprawling city. The Archeological Museum, which covers 3.5 million years ago to the present day, houses the skeleton of “Lucy” the earliest known hominid. Addis has an enormous open market. Restaurants are good and plentiful, and the people courteous. Christians and Muslims live largely in harmony. 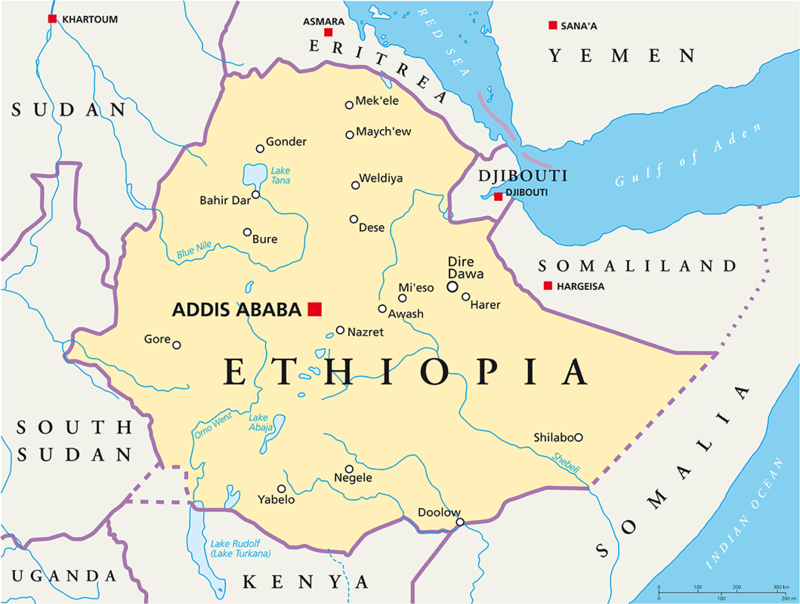 The centre of Islam in Ethiopia is Harer, in the north east of the country. It was founded in the 7th Century, and is a fine walled fortified city, known for its basket-making and weaving. It also has a strange claim to fame in that it’s home to the family whom for generations have fed wild hyena. A strange bond has evolved and the hyena turn up every night to be fed – seeming to act more like domestic dogs than potentially ferocious wild animals. South from Addis down the Rift Valley simple rural life continues as it has for centuries. The majority of people are pastoralists. The Bale Mountain National Park is home to a number of endemic birds and animals and along with the Simien Mountains in the north is home to the rare and beautiful Ethiopian wolf. Indeed, there are over 800 species of birds in Ethiopia and more than 100 mammals. The lakes in the Rift valley are sometimes bordered with the pink of thousands of flamingo, making quite a spectacle to behold, especially if they all take to the air together. The Danakil Depression, on the border with Eritrea, is an extraordinary and unworldly place. The acid greens and yellows of Dallol form as heat and chemicals spill out of the earth in this volcanically active area – it is a real sight to behold. There are also active volcanoes, such as Erte Ale, which has had a continuously active lava lake, since it was first discovered by the outside world in the 1960s – if you’re feeling adventurous, you can spend a night camping on the lip of the crater.